Did you know that when spinal bones (vertebrae) are not moving correctly, it can affect our nerves, muscles and even blood supply throughout the body? Chiropractic is a branch of the healing arts based upon the understanding that good health depends, in part, upon a normally functioning nervous system and proper movement of the spine and spinal segments (vertebrae). Both are important because the nerves that affect every part of our body exit from the spinal cord between each of the vertebrae. Chiropractic theory stresses the idea that when the body experiences nerve irritation it is less able to combat causes of disease. 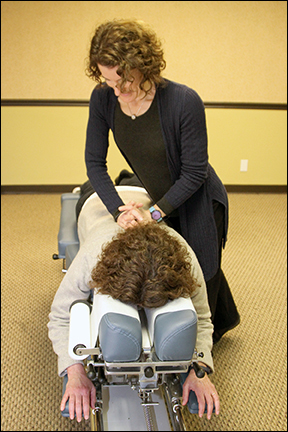 A series of chiropractic adjustments can normalize spinal function, restore essential spinal curves, improve circulation and reduce nerve irritation. The practice of chiropractic involves a range of diagnostic methods including skeletal imaging, observational and tactile assessments, and orthopedic and neurological evaluations. By careful, personalized adjustment to muscles and joints, Chiropractic treatments positively impacts organs, nerve systems and muscle groups. The primary treatment involves manual therapies including adjustment of the spine, extremities and soft tissue. Treatment may also be combined with rehabilitative exercises, acupuncture, microcurrent therapy, health lifestyle and restorative recommendations. In some cases, we may refer you to an appropriate specialist, or partner with another health care provider to co-manage your treatment. Click here to view FAQs regarding chiropractic care.